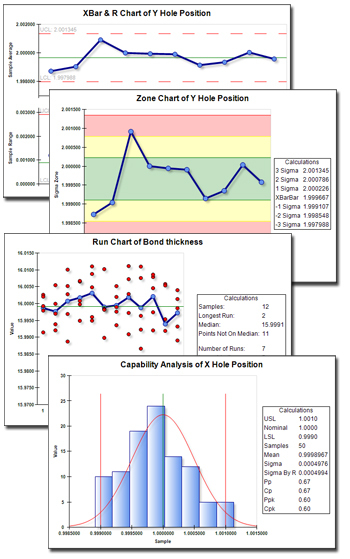 Need training on the latest advanced features in QC-CALC and QC-Gage?? Sign up now and receive a special software discount! Learn more about the Administrative Tools in QC-CALC 3.2 and start managing your settings and privileges centrally. Come visit us to see the latest improvements!! Prolink is proud to announce release of the new Prolink Charting package for use with the SPC Office Buddy. This new charting package is perfect for creating SPC charts and statistics on the fly or for use in your Excel spreadsheets. The following are just a few of the new features in the Prolink Charting package. Ability to right click and copy chart images into your other documents, Powerpoint presentations, etc. Full support for Excel Jobs allowing you to automatically place the charts into your custom Excel reports. Ability to add literal calculation values into your Excel reports with or without displaying a chart. This includes support for all major statistical calculations such as Mean, Min, Max, Range, Cp, Cpk, Pp, Ppk, Sigma, Control limits, SigmaByR, and more. Gage R&R capability along with Gage R&R calculations. This includes Part Variation (PV), Repeatability(EV), Reproducibility(AV) and Total GR&R. Download the latest version of the SPC Office Buddy 3.2 and it will be installed automatically. If you already have the SPC Office Buddy 3.2, please download the latest full version and install it over your existing copy. There will be no effect on your existing license. To use it, simply go to Tools > Options > Chart Settings and choose Prolink Charting from the Chart Tool list. If you have not purchased the Prolink Charting option, the charts will have watermarks and a screen that reminds you to purchase will appear. Once licensed, this will stop. Tip: Delay your measurement in QC-Gage 3.2?? We have been asked about this a few times so we finally added it to QC-Gage 3.2. When you're collecting data in QC-Gage, a picture of the plot with historical measurements is shown on the data entry screen. This is useful if you are looking at the past measurements, but what if you want to look at the measurement you just took? It typically happens so quickly that the focus moves to the next measurement before you get a chance to see how the plot looked when you took the measurement. To allow you to see the results, we have introduced an option to allow you to delay the screen x seconds before moving to the next measurement. This gives you a little time to see your measurement without having to backtrack. 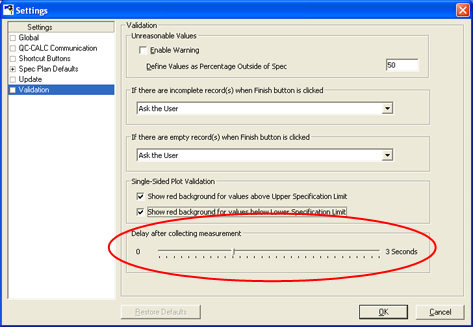 In QC-Gage 3.2, go to Tools > Options > Validation. At the bottom of the screen, use the slider to select an amount of time to delay. The range is 0-3 seconds. When you measure your parts, you will notice that after the measurement occurs, the screen will then delay for the time specified and allowing you to look at the plot before proceeding. If you have QC-Gage 3.2, all you need to do is click Help > Run Update or download the latest update from our website. If you have an earlier version of QC-Gage, then it's a great time to upgrade and take advantage of all the new features in QC-Gage 3.2. You can download version 3.2 and install it into a different folder to try it out before upgrading since multiple versions can coexist.